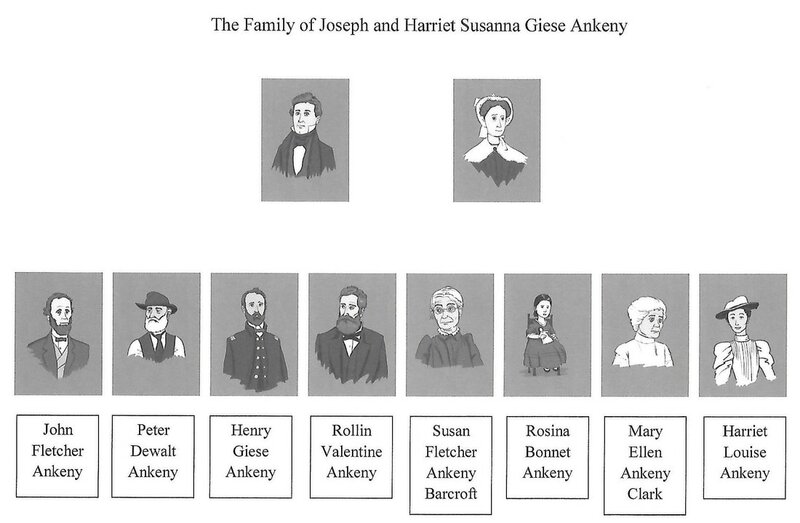 Joseph Ankeny and Harriet Susanna Giese met and were married in Somerset County, Pennsylvania. Four sons were born in Pennsylvania. They moved their family to Millersburg, Ohio. Four daughters were born in Ohio. Joseph dreamed of moving to Iowa and purchased land in Iowa. When the Civil War broke out their plans for moving to Iowa were halted. After the Civil War the whole family eventually moved to Iowa. Their children led interesting, impressive and remarkable lives. Their stories are told in the book Iowa's Devoted Daughter -- the Story of Miss Harriet Louise Ankeny and Her American Family. As of February 23, 2016, Joseph and Harriet had 300 known descendants. They had 8 children, 33 grandchildren, 49 great grandchildren, 75 GG grandchildren, 81 GGG grandchildren, 46 GGGG grandchildren and 8 GGGGG grandchildren.